Aim of Study: Since the discovery of microRNAs (miRNAs) in the 1990s, our knowledge about their biology has grown considerably. The increasing number of studies addressing the role of miRNAs in development and in various diseases emphasizes the need for a comprehensive catalogue of accurate sequence, expression and conservation information regarding the large number of miRNAs proposed recently in all organs and tissues. The objective of this study was to provide data on the levels of miRNA expression in 15 tissues of the normal human brain. Materials and Methods: We conducted an analysis of the relative levels of 88 of the most abundantly expressed and best characterized miRNA derived postmortem from well-characterized samples of various regions of the brains from five normal individuals. 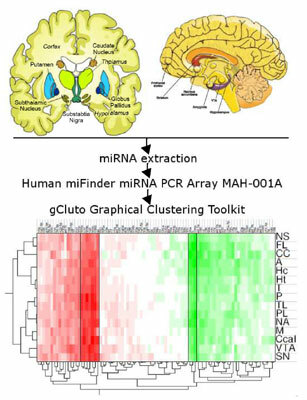 Results: The cluster analysis revealed some differences in the relative levels of these miRNAs among the brain regions studied. Such diversity can be explained by different functioning of these brain regions. Conclusion: We hope that the data from the current study are a resource that will be useful to our colleagues in this exciting field, as more hypotheses will be generated and tested with regard to small noncoding RNA in the human brain in healthy and disease states. Keywords: Brain, cluster analysis, expression, human, microRNA, normal brain tissues. Keywords:Brain, cluster analysis, expression, human, microRNA, normal brain tissues. Abstract:Aim of Study: Since the discovery of microRNAs (miRNAs) in the 1990s, our knowledge about their biology has grown considerably. The increasing number of studies addressing the role of miRNAs in development and in various diseases emphasizes the need for a comprehensive catalogue of accurate sequence, expression and conservation information regarding the large number of miRNAs proposed recently in all organs and tissues. The objective of this study was to provide data on the levels of miRNA expression in 15 tissues of the normal human brain.